Whilst it isn’t the most powerful of the mini-notebooks, or the most aesthetically pleasing, with a 7inch screen you can’t argue with the weight: 0.65kg!! That makes the 0.922kg of the Eee PC 701 look decidedly over-weight, whilst the Eee 901 will barely be able to hold its head up in public at 1.14kg. 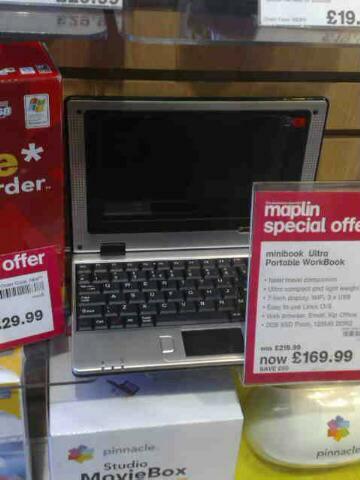 Maybe I need Maplin’s minibook for those days when I am feeling too lazy to carry my 701…or should I just hold out for the one that comes with a helium filled balloon? I am also slightly surprised at the claim on the ‘minibook’ trademark, after all, wasn’t the Eee PC 701 first launched in the UK as the RM minibook? Email is dead; long live …. I have always enjoyed checking to see if I have any post. Whilst it is usually a bill, the offer of a credit card, or the promotion of Sky TV, there is always the chance that it could be something far more interesting and exotic (such as the free book of stamps I received last week). When the Royal Mail’s did away with the second-post, I overcame the loss by checking my emails more often. Now, however, I find that my email is increasingly unreliable. My email problems started back in March when Hotmail started only selectively sending my emails. Whilst this was seemingly a glitch with Hotmail, as a opposed to a problem with email as a communication medium, the seeds of doubt were sown. Since then my university has installed an email filtering system to deal with spam. Not a selective filtering system that is applied to those people who have a problem with spam, but across the board! I now find that unless I spend twice as long constructing an email, e.g., filling it with excess text and making sure there are no mentions of banks or money (as a general rule my emails rarely mention viagra anyway), only half of my Hotmail emails reach their university destination without being quarantined for a few hours first. In addition a number of emails sent from university addresses to me are mysteriously disappearing. Yes, I could do away with my Hotmail account and use my university account, but that does not seem to be a practical solution. Most people (especially students) have one account that they already check regularly when they arrive at a university, forcing them to check another email address will merely mean communications sent to that email address are left for days or weeks on end before being retrieved. Whilst I’m sure that some IT departments are more selective when they roll out spam guards, unless you are aware of the exact filtering systems in place at the email’s destination, you can never be sure whether your email has reached it’s destination or not. As such email, in its current state, is as good as dead. Unfortunately there doesn’t seem to be anything capable of replacing it, but if someone does come up with a solution there will be a lot of money to be made. Iterasi: Create your own archive! The UK’s web archive is pretty rubbish, therefore Iterasi (highlighted by TechCrunch) is a great addition to the web. Rather than merely bookmarking a URL, you can archive the actual page, and can continue archiving the page on a regular basis if you so wish. The only downsides to the site are that it only allows you to archive on a daily basis (for the front pages of news sites you may want to archive more regularly), and it only archives when your computer, with its list of scheduled saves, is turned on. It also has potential for bloggers; when they discuss a page or story bloggers can now be sure that their readers will have access to the page that they saw rather than an updated version. How content providers will react to the archiving of their content is yet to be seen.